November news: November's not off to the hot start "Inferno" might have delivered, but with "Doctor Strange" on the horizon there's real hope for a boxoffice upturn. Columbia and Imagine Entertainment's PG-13 rated mystery thriller "Inferno" opened last weekend in second place to $15 million. Lionsgate and The Tyler Perry Company's "Boo! A Madea Halloween" held on as number one in its second week with $16.7 million and a domestic cume of $52 million. opened internationally to $50 million from 53 territories. That international cume's grown now to about $133 million, including its first place opening in China last weekend to about $13.3 million. The picture reportedly cost $75 million to produce, so with a worldwide cume that's already pushing $150 million just from theatres, Sony isn't likely to be badly hurt. A domestic launch north of $35 million would have made "Inferno" this fall's biggest opening, overtaking the PG-13 rated biographical drama "Sully" from Warner Bros., Village Roadshow Pictures and RatPac Entertainment, which arrived Sept. 9 to $35 million. Instead, "Inferno" ranks 10th on the fall openings chart. Based on the novel by "The DaVinci Code" author Dan Brown, "Inferno" is the franchise's third episode. The book was on the New York Times' best seller list for 11 weeks and reportedly sold 6 million copies. The film stars two-time Oscar winner Tom Hanks, who starred in the first two films as symbologist Robert Langdon. It's directed by two-time Oscar winner Ron Howard ("The Da Vinci Code," "Angels & Demons"). "Da Vinci" opened May 19, 2006 to an enviable $77.1 million and did $217.5 million domestically. It did $540.7 million internationally and had a global cume of $758.2 million. "Demons" didn't do nearly as well, opening May 15, 2009 to $46.2 million. It went on to do $133.4 million domestically. It did $352.6 million internationally and had a global cume of $485.9 million. Although there were early hopes that "Inferno" would reverse the franchise's downward trend and pump some new life into what's been a dreary fall season, that didn't happen. It seems a safe bet, however, that Marvel Studios and Disney's PG-13 rated 3D action adventure fantasy "Doctor Strange" will inject some real energy at the boxoffice when it opens Friday at about 3,800 theatres. Disney said Sunday that "Strange" opened internationally last weekend to $86 million from 33 territories and that, "next weekend sees openings in Russia (wide), Brazil and China along with Croatia, Hungary, Israel, Lebanon, Slovakia, Slovenia, Norway, South Africa, Turkey, India, Ecuador, Trinidad, Panama, Uruguay, Paraguay, Peru, Bolivia, Chile, Colombia and Venezuela." Comparing "Strange's" international launch to past Marvel/Disney hits, the studio noted, "We estimate that this opening is 49% ahead of 'Ant-Man', 37% ahead of 'Guardians of the Galaxy,' 23% ahead of 'Captain America: The Winter Soldier' and 1% ahead of 'Thor: The Dark World' when comparing the same suite of territories and all at today’s exchange rates." Those results seem all the more impressive considering that "Strange" hasn't been one of Marvel's highest profile comic book properties, although it will be now. Hollywood handicappers have been buzzing about a domestic opening in the $50 million to $75 million range. "Strange's" 92 percent fresh score on Rotten Tomatoes reflects critical acclaim that could bring in older male moviegoers who don't automatically turn out for comic book driven films. A summer-sized splash for "Strange" would certainly help boost the boxoffice year-to-date numbers. Through last weekend, 2016's ticket sales are $9.21 billion, up about 3.4 percent from $8.90 billion this time last year, according to comScore. A week ago, this year was ahead by 3.5 percent after slipping week after week since late summer. "Strange," directed by Scott Derrickson ("Deliver Us From Evil"), stars Benedict Cumberbatch, Chiwetel Ejiofor and Rachel McAdams. It's the story of neurosurgeon Stephen Strange (Cumberbatch), who after a terrible car crash discovers the secrets of a hidden world of mysticism and alternate dimensions. 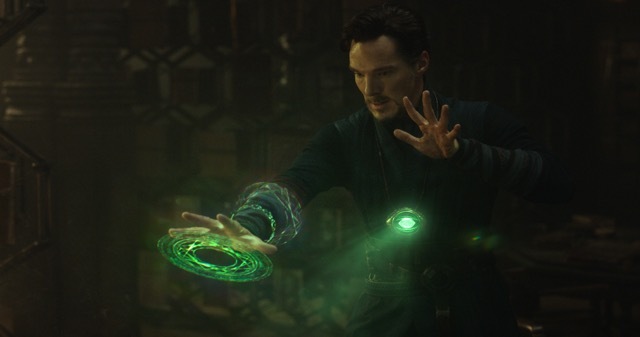 That turns Strange into an intermediary between the real world and what lies beyond, using his new metaphysical abilities and artifacts to protect the Marvel Cinematic Universe. Fall could be perfect timing for a comic book driven summer-style superhero action adventure like "Strange." It should play best to men under 25. Marvel's films have mostly hit theatres from early spring to late summer. However, Marvel gave its sequel "Thor: The Dark World" a Nov. 8, 2013 opening – taking in $85.7 million and ending up with $206.4 million domestically. Shifting "Thor" to late fall where it would stand out instead of just being one more summertime superhero epic paid off big time for Marvel and Disney. Although "Strange" is an original, its Marvel Cinematic Universe connection gives it a high profile with moviegoers who know and love the brand. Despite its mega-boxoffice potential, "Strange" will still face competition this weekend from two other wide releases. 20th Century Fox and DreamWorks Animation's PG rated animated comedy adventure "Trolls" opens at about 3,950 theatres. Directed by Mike Mitchell ("Alvin and the Chipmunks: Chipwrecked") and first-time feature director Walt Dohrn, its voice stars include: Anna Kendrick, Zooey Deschanel and Justin Timberlake. "Trolls," per Fox, is "the story of the overly optimistic Trolls, with a constant song on their lips, and the comically pessimistic Bergens, who are only happy when they have trolls in their stomach. Featuring original music from Justin Timberlake, and soon-to-be classic mash-ups of songs from other popular artists..."
Families and, especially, moms-with-kids will be the core audience for "Trolls." Hollywood will be targeting adult men this weekend with Lionsgate and Summit Entertainment's R rated biographical drama "Hacksaw Ridge," opening at about 2,700 theatres. Directed by actor-director Mel Gibson -- who's been in Hollywood's doghouse the past decade since his anti-Semitic rant in Malibu following a DUI arrest -- it stars Teresa Palmer, Andrew Garfield and Vince Vaughn. War films typically play adult male, but there's talk that "Hacksaw" with its conscientious objector true story might also resonate with adult women. Gibson's a two time Oscar winner – in 1996 for directing "Braveheart" and for best picture as a producer of "Braveheart." "Hacksaw" world premiered Sept. 4 at the Venice Film Festival, where it was very well received and generated an early Oscar buzz for Gibson. Garfield plays U.S. Army Medic Desmond T. Doss, who served during the Battle of Okinawa, but refused to kill people. Doss became America's first conscientious objector ever to be awarded the Medal of Honor. Nov. 11-13: Two major studio wide releases will be competing for moviegoers' time and money over this weekend that includes the Veteran's Day holiday. Paramount Pictures' PG-13 rated sci-fi mystery "Arrival" is directed by Denis Villeneuve ("Sicario") and stars five time Oscar nominee Amy Adams, two time Oscar nominee Jeremy Renner and Forest Whitaker, an Oscar best actor winner for "The Last King of Scotland." Sci-fi films usually play best to adult men, but Adams may broaden "Arrival's" appeal to include an adult female demo. Adams plays expert linguist Louise Banks, who becomes part of an elite investigating team when mysterious spacecraft land around the globe. With global warfare imminent, Banks races against time. But finding the answers she needs means taking a chance that can threaten her life and, quite possibly, all of humanity. Universal and Rovio Entertainment's PG-13 rated comedy drama "Almost Christmas" is directed by David E. Talbert ("Baggage Claim") and stars Jessie T. Usher, Gabrielle Union and Danny Glover. It should play best to adult women. Its storyline revolves around a dysfunctional family celebrating Thanksgiving together for the first time since their mom passed away. Sony's TriStar Pictures and Marc Platt Productions' R rated 3D war drama "Billy Lynn's Long Halftime Walk" was also to have opened wide Nov. 11, but it's now starting with exclusive engagements and expanding from there. Directed by Ang Lee -- a two-time best directing Oscar winner -- in 2006 for "Brokeback Mountain" and in 2013 for "Life of Pi" – it stars Kristen Stewart, Vin Diesel and Garrett Hedlund. Like most war films, it should play best to adult men. Based on the bestselling novel by Ben Fountain, it's the story of 19-year-old private Billy Lynn (newcomer Joe Alwyn), who with his fellow Bravo Squad soldiers becomes a hero after a traumatic Iraq War battle and is brought home for a victory tour. Using flashbacks culminating in a Thanksgiving Day football game's halftime show, Lee reveals what really happened to Bravo Squad. The film's new ultra-high 120 frame-per-second rate technology is a key marketing element for making the battle scenes an immersive digital experience. NOV. 18-20: Three films will open wide this weekend to position themselves for next week's Thanksgiving holiday moviegoing, but one of the three stands out as the likely big moneymaker -- Warner Bros. and Heyday Films' PG-13 rated 3D fantasy family adventure "Fantastic Beasts and Where to Find Them." Directed by David Yates, director of the last four "Harry Potter" franchise episodes, it's set 70 years before the "HP" stories. As "Beasts" is from the wizarding world of J.K. Rowling, it should play to the same broad demo as her "HP" franchise did. Rowling has said there will be five episodes in the "Beasts" franchise, so getting this one off on the right foot is essential. Hollywood handicappers are already talking about "Beasts" running wild with an opening of $75 million or more. The last "HP" episode to open in the fall was "Harry Potter and the Deathly Hallows, Part 1" with $125 million on Nov. 19, 2010. It wound up doing $296 million domestically. Best actor Oscar winner Eddie Redmayne stars as "magizoologist" Newt Scamander, who arrives in 1926 New York after a global excursion to document an extraordinary array of magical creatures. What was meant to be a quick stopover turns into something else after some of Newt's quite fantastic beasts escape. STX Entertainment and Gracie Films' R rated comedy drama "The Edge of Seventeen" is from first time feature director Kelly Fremon Craig and stars Hailee Steinfeld, Haley Lu Richardson and Blake Jenner. It should play best to moms and their teenage daughters. Steinfeld, a supporting actress Oscar nominee in 2011 for "True Grit," plays Nadine, an awkward high school junior whose all-star older brother (Jenner) starts dating her best friend (Richardson). Nadine feels more alone than ever, but the unexpected friendship of a thoughtful boy (Hayden Szeto) helps her see that things aren't really as horrible as she thought. Open Road Films' R rated biographical sports drama "Bleed For This" is directed by Ben Younger ("Prime") and stars Miles Teller, Katey Sagal and Ted Levine. It should play best to adult men. Teller plays World Champion boxer Vinny Pazienza, who was in a near fatal car accident after which his doctors didn't know if he'd ever be able to walk again. The film is about Vinny making one of the most incredible sports comebacks ever. NOV. 23-27: Thanksgiving Day is Th., Nov. 24, so Hollywood will start stuffing the multiplexes with new wide releases on Wed., Nov. 23. Four wide openings will try to carve themselves a sizable share of the busy five day holiday movie marketplace. Paramount and GK Films' romantic action drama "Allied" is from Robert Zemeckis, Oscar winning director of "Forrest Gump" and stars Oscar winners Brad Pitt and Marion Cotillard. Pitt plays intelligence officer Max Vatan, who encounters French Resistance fighter Marianne Beausejour (Cotillard) on a deadly mission behind enemy lines in 1942 North Africa. When they reunite in London, the war's extreme pressures threaten their relationship. "Allied" could enjoy some extra boxoffice gravy from arriving on the heels of Pitt's marital split with Angelina Jolie. It should play best to adult men and women. Pitt's World War II set movie "Fury" opened Oct. 17, 2014 via Columbia to $23.7 million and did $85.8 million domestically. It was directed by David Ayer, whose next film was "Suicide Squad," and also starred Shia LaBeouf and Logan Lerman. What "Allied" has that "Fury" lacked is a romantic storyline that should broaden its appeal to adult women. Walt Disney Pictures' PG rated 3D animated comedy adventure "Moana" is from Ron Clements and John Musker, directors of "Aladdin" and "The Little Mermaid" and stars the voices of Dwayne Johnson, Alan Tudyk and Nicole Scherzinger. It should be a multiplex magnet for parents trying to keep their kids occupied over the long Thanksgiving weekend. 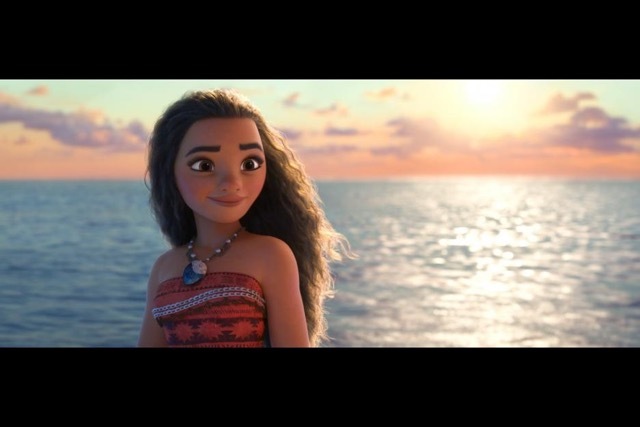 In "Moana," an adventurous teen girl, with help from the demigod Maui, sets sail on a daring mission to prove herself a master wayfinder and to save her people. Disney and Pixar Animation's PG rated 3D animated comedy adventure "The Good Dinosaur" opened last Thanksgiving on Nov. 25, 2015 to $39.2 million and did $123.1 million domestically. 20th Century Fox and New Regency Pictures' PG-13 rated romantic comedy drama "Rules Don't Apply" is directed by Warren Beatty, a best directing Oscar winner in 1982 for "Reds." Starring are: Warren Beatty, Lily Collins and Alden Ehrenreich. It should play best to adult women, who are likely to drag adult men along to see it. In "Rules," which takes place in 1958 Hollywood, an aspiring young actress (Collins) and her ambitious young driver (Ehrenreich) struggle hopefully with the absurd eccentricities of their wildly unpredictable billionaire boss -- Howard Hughes (Beatty). Broad Green Pictures and Miramax's R rated comedy "Bad Santa 2" is directed by Mark Waters ("Mean Girls") and stars Billy Bob Thornton, Kathy Bates and Tony Cox. It should play best to adult men. The original "Bad Santa" opened Nov. 26, 2003 via Dimension Films to $12.3 million and did $60.1 million domestically. In the sequel, con man Willie Stokes (Thornton) is driven by alcohol, greed and hatred to play Santa once again and with the help of his angry little sidekick, Marcus (Cox), rob a Chicago charity on Christmas Eve. Bottom line: If you're not happy with how this fall's been going, don't despair. This time next year we should be seeing marvelous ticket sales for Marvel and Disney's "Thor: Ragnarok." Directed by Taika Waititi ("What We Do In the Shadows"), the 3D sci-fi action adventure sequel won't be battling (at least, as of now) any other wide openings the weekend of Nov. 3-5, 2017. Waititi directed the well received mockumentary short "Team Thor" that Marvel and Disney showed at Comic-Con last summer, giving a behind-the-scenes look at Thor (Chris Hemsworth) during production of "Captain America: Civil War." The new episode stars: Chris Hemsworth, Tom Hiddleston, Mark Ruffalo, Cate Blanchett, Tessa Thompson, Jaimie Alexander, Lou Ferrigno, Jeff Goldblum, Karl Urban, Idris Elba and Anthony Hopkins. This time around, Thor confronts the gods when Asgard's threatened by the Norse apocalypse Ragnarok. The original "Thor" was an early summer release, arriving May 6, 2011 to $65.7 million. It did $181 million domestically and took in $268.3 million internationally for a global cume of $449.3 million. The second episode, "Thor: The Dark World," opened Nov. 8, 2013 (a smart move to the fall, as noted above) to $85.7 million and did $206.4 million domestically. It grossed $438.2 million internationally for a worldwide cume of $644.6 million.